MegiQ Network Analyzer VNA-0440 ! !Special Offer!! PC based 4 GHz 2-port Vector Network Analyzer with a Frequency range from 400 MHz to 4 GHz. Measuring power from -30 to +5dBm with up to 20000 points. Power adapter, USB cable, Software, User manual and Carrying case. 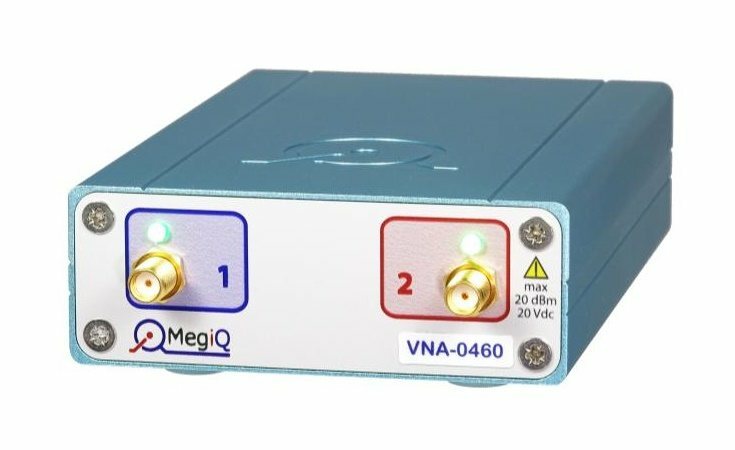 The MegiQ VNA-04x0 / VNA-04x0e are compact Vector Network Analyzers that are used for professional antenna and network measurement and optimization. With a frequency range of 400MHz to 4GHz and 6GHz they are very well suited for characterization and measurement of S parameters of 1, 2 and 3 port networks such as antennas, matching networks, amplifiers, filters, power splitters etc. They cover all popular communication bands that are used worldwide. Characterize wireless devices of today, like IOT devices, routers, phones, domotica products, electronic gadgets, tablets, laptops, RF-modules etc. 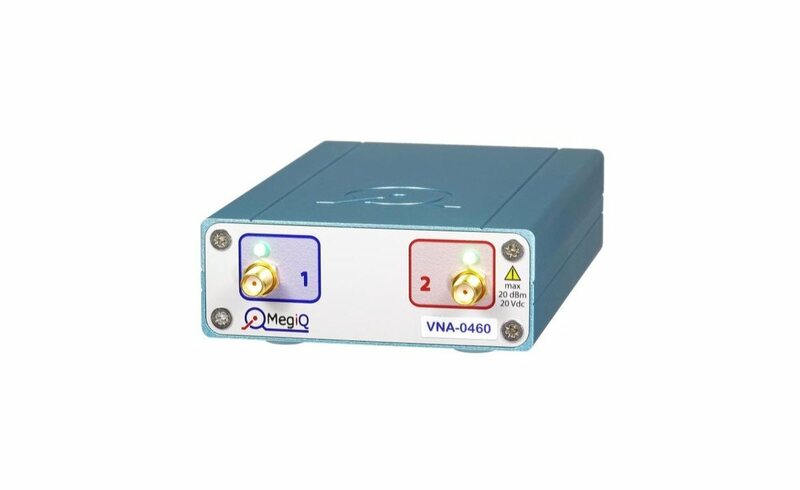 The MegiQ VNA-0440 is widely used for developing professional and consumer wireless products. Our accessories make it easy to measure the miniature products of today. 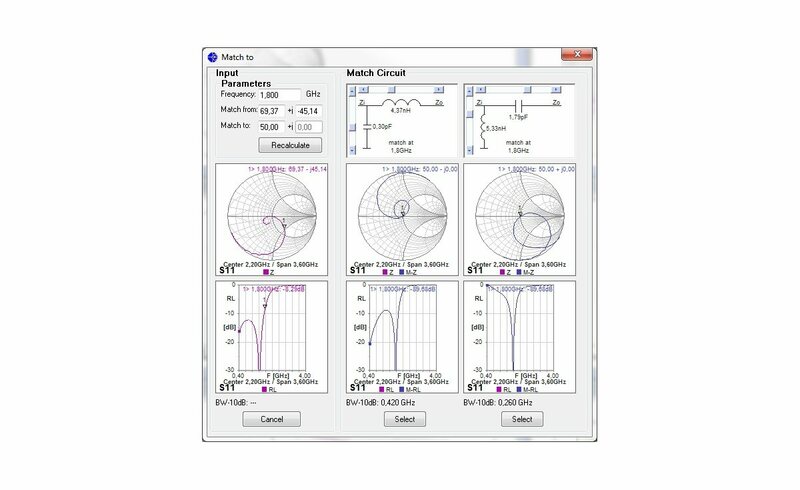 Presets: With several preset measurements for 1-port and 2-port measurements the VNA software is very easy to use for most common measurements like impedance and gain. Calibration: Measurements on SMA devices can be done directly at the VNA ports without any calibration. 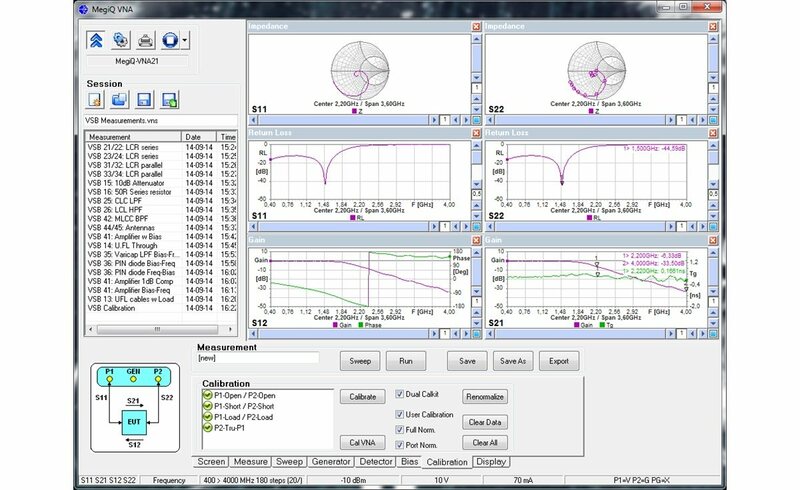 For measurements through cables and adapters the software guides through the Open-Short-Load-Through calibration process and the VNA front panel will indicate which termination to calibrate next. The Dual Calkit option makes calibration 3 times faster. Screen: The screen was layed out for operation with a touch screen. The graphs can be dragged in any way with any of the graph types for the measurement. There are several color schemes. Sweeps: The software provides a sweep manager that allows combining multiple paramaters (frequency, power, bias variables) into a parametric sweep. This is useful for characterizing active circuits like amplifiers, switches, varactors, pin diodes etc. Session Manager: Measurements can be stored in a session manager that keeps the measurements for a session in a single file. All settings including calibration, screen layout, markers etc are stored in the session. API: An Application Programming Interface for VB, C++, C#, Labview, etc is available to allow integration of the VNA-0440 in a lab setup or an automated factory testing system. 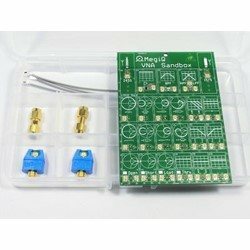 The MegiQ VNA Sandbox is a circuit board with many different experiments to demonstrate the features of VNAs in general and the VNA0440e in particular. It comes with a printed tutorial showing how to measure and explaining the results you see. It can also be used as a reference to verify the correct operation of a test setup. It is ideal for understanding and/or teaching the use of Vector Network Analyzer and its measurements. It comes with a Lab Guide. VNA Sandbox board, SMA/UFL adapter, UFL/UFL cable, UFL jack and Getting started guide. The SMA-6B Basic calibration kit provides the elements for performing Open–Short–Load and Through calibrations for one and two port VNA measurements. The male Open–Short–Load elements can be used directly on female measurement ports. With the Female-Female adapter the calibration elements provide calibration for Male measurement ports. Two SMA wrenches (for nut and for shaft) are provided to get a reliable mating without damaging the connectors. The Load match is better than 30dB. Generic correction coefficients for the elements are provided. A CalKit definition file for MegiQ VNAs is available for easy import in the software. Male Open, Male Short, Male Load, Male-Male Through, Female-Female Through, SMA wrench tools and SMA M-M cable 30cm. The SMA-6F Full calibration kit provides all elements for Male and Female Open-Short-Load and Through calibrations for one and two port VNA measurements. With separate Male and Female elements this kit provides more reliable and easier calibration than the Basic kit. Two SMA wrenches (for nut and for shaft) are provided to get a reliable mating without damaging the connectors. The kit includes a USB stick with correction coefficients and a full set of S-parameters for full calibration element correction. The Load match is better than 34dB. The S-parameters of the Load elements are individually measured for high precision measurements and provides an effective Load match of better than 40dB. The correction coefficients are provided as MegiQ CalKit file and as Touchstone S-parameters for import in other brand VNAs. Male Open, Male Short, Male Load, Male-Male Through, Female-Female Through, SMA wrench tools, USB stick with measured coefficients and SMA M-M cable 30cm.